Clean and Clear Cartridge Filter 150 Sq. Ft.
A Answered on 4/5/2019 by InyoPools Product Specialist Lennox H.
Hi, Jay. The filter cartridge should fit as shown in the image. If it's lower, then you're using the wrong cartridge with the center core. I currently have a sand filter with a 1 1/2 HP sta-rite by Pentair pump and an above ground pool with a 15000 gallon capacity. What size cartridge filter should I use? So if you're currently using an above pool pump model then I would recommend going with any 100 to 150 sq. ft. model cartridge filter. Now if you are using an inground pool pump model then you really need to confirm that motor model, part or catalog number then let us know so we can confirm for you. Hi, Jean. The Pentair Clean and Clear 150 - 59054300 (OEM) or PL0137 (Aftermarket) are the replacements that you can use for this model filter. Is the Clean & Clear 150sq ft the right size filter for a 20,000 gal inground? A Answered on 10/3/2017 by InyoPools Product Specialist Stacey M.
Hello Robert, that would be more than enough for a 20,000 IG pool. which way do you turn the union fittin at bottom to remove it from the PVC pipe? To loosen you would turn counter clockwise, to tighten you would turn clockwise. It comes with the cartridge, no need to purchase another one unless you are just wanting an extra one for when you are cleaning the dirty one. Are the 2" connector in line at the bottom (so I don't have to redo my plumbing)? Thank you. I currently have a 48sqft Pentair DE filter with a 1.5hp Pentair pump. My pool is 36,000 gallons. What size cartridge filter would I need? Hi Chris, If you are looking to change from DE to cartridge then the equivalent to your 48 Sq. 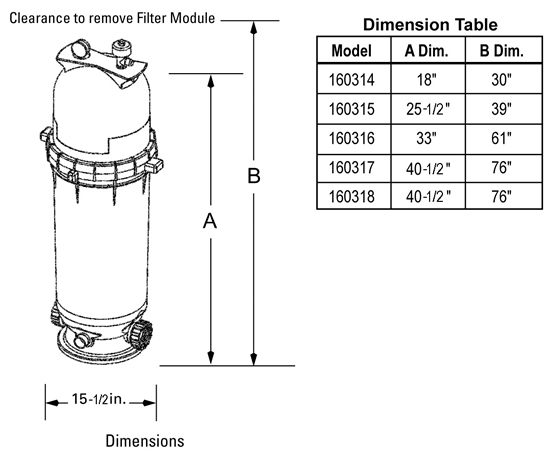 Ft. DE Filter would be the Clean & Clear Plus 420 Cartridge Filter. Does the filter have 2" plumbing? A Answered on 11/9/2015 by InyoPools Product Specialist Charlie R.
Yes, the Clean and Clear 150sq ft has 2 inch plumbing. Is there an ideal pressure for the 160317 or any other of these filters to operate at for maximum efficiency and endurance? The ideal pressure on the Clean and Clear Cartridge Filter 150 Sq. Ft. or any other filtration unit depends on several factors such as hp of pump, water flow and plumbing size. This filter has a maximum PSi of 50, so with a dirty filter you don't want the filter to exceed 50 PSI. The lower the pressure the more efficient the filter will be and the longer it will last, so you always want to go with a larger than normal unit. I bought one of these filters 2 weeks ago and I don't know what type of cement to use on the black union fittings provided. I plan on cementing a white slip-on connector for then connecting a 2" SCH-40 PVC pipe. Do I use Universal CPVC/PVC cement, regular PVC cement, or what? Hello PRJ - We would recommend the Rain & Shine blue pvc cement. A Answered on 2/20/2015 by InyoPools Product Specialist Hector F.
Typically this unit is used for inground pools but you can use it for either application. Pool size is approximately 23,000 gal. (32 x 16 x 5 feet) what size Pentair clean and clear cartridge filter system do I need? A Answered on 1/6/2015 by InyoPools Product Specialist Robert M.
Hello Cindy - The CC100 or CC150 would be a sufficient size filter for your pool. The CC150 would not have to be cleaned as often. The filter unit seems to be working great. The plumber who installed it said that it is a good system.